Liczba stron: 3876 Jest to ujednolicona liczba stron, która ułatwi Ci porównanie długości książek. Każda strona Legimi to 200 słów. Ambrose Bierce is considered one of the great American writers, ranked with Mark Twain, Edgar Allen Poe, and Nathaniel Hawthorne. He was renowned for his wit and his wide literary talents, encompassing satire, horror, literary criticism, and journalism. Bierce was born on June 24, 1842 to Marcus Aurelius Bierce and Laura Sherwood Bierce. He was the tenth of thirteen children, all of whom received names beginning with the letter A. Though never close to his family, their extensive library did ignite the spark of literary ambition in the young Bierce. At the age of fifteen, he became a printer's devil at a small Ohio newspaper. He later joined the Union army during the Civil War, participating in a large number of battles and gaining first-hand experience of the horrors of war, a theme that would emerge in his later writing. He was seriously wounded in the head during the Battle of Kennesaw Mountain in 1864, and suffered from complications from this wound for the rest of his life. He married Mary Ellen "Mollie" Day in 1871, and the couple had three children: Day, Leigh, and Helen. Two of the children died before Bierce, Day from suicide and Leigh from pneumonia. Bierce and his wife divorced in 1904. Well-known for his biting political analysis and satire, especially as exemplified in The Devil's Dictionary (a dictionary offering new and sarcastic definitions of common terms), Bierce also wrote a succession of eerie stories set mostly in the American frontier from 1888 and 1901. These proved foundational for later horror writers, including HP Lovecraft and Stephen King. 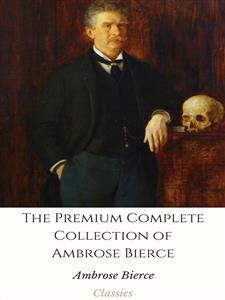 The official date of Bierce's death is unknown. In 1913, he traveled to Mexico during the revolution in order to see the situation on the ground for himself. He is said to have traveled with Pancho Villa's army to the city of Chihuahua. Perhaps fittingly for a writer famous for his eerie stories and shocking twists, his last letter concluded, "As to me, I leave here tomorrow for an unknown destination." His most famous short story, "An Occurrence at Owl Creek Bridge," in which a captured Civil War solider hallucinates that he has traveled through time, has been adapted in various mediums, including as a television episode of The Twilight Zone. Many of his short stories have been made into short films or episodes of ongoing television series.